Labour Councillors have pledged to help erect a memorial to 16 year-old Jessie Wright who died in tragic circumstances just 3 weeks ago. 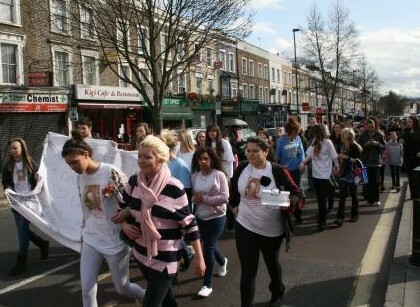 On Sunday 28th, 100 local teenagers marched in Jessie’s memory. With mums pushing prams and older family members they headed in a procession from Randell’s Road and up the Caledonian Road. The young girls and boys leading the march – dressed in Jessie’s favourite colours – had signed their names and messages for Jessie on a large banner. The procession went past many of Jessie’s favourite places up the Cally Road. They also stopped to collect money for a memorial which they hope to put up somewhere near where Jessie lived. Labour Councillors have pledged to help the youngsters achieve their ambition. Paul Convery joined the teenagers for an hour on Sunday and promised to find a suitable place for a permanent memorial. He wished the kids good luck raising the money and pledged to Jessie’s sister Molly that Councillors would match the money needed to make sure a fitting and lasting memorial can be erected. Paul added “this tragedy has really shocked the neighbourhood and caused deep distress to the children and young people around here. These kids, their families and friends are demonstrating their great sadness but also their determination to make this a safer and better neighbourhood for them to grow up in. As local Councillors, we shall give them every support necessary to achieve that”.